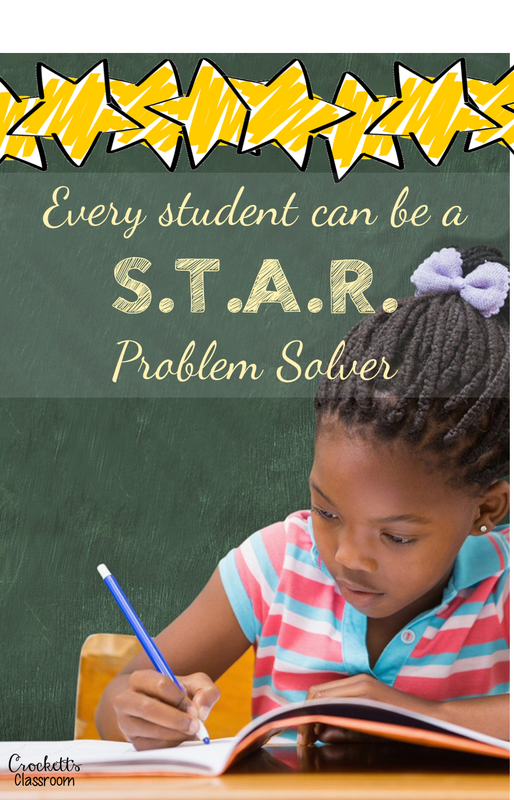 With the right tools, every student can be a star with problem solving. You just need to show them how to read and understand the problem, much like you teach comprehension during your reading lessons. Using the I do it, we do it, you do it model I first teach the 4 steps to problem solving. I do it- I read the word problem and do my thinking out loud so the whole class can hear my thoughts and the questions I'm asking myself. I show them how I figure out what the story problem is asking and how to pull out the important information. Then I model one of the problem solving strategies, find the solution and most importantly, go back to review and check my answer. We do it- First I'll read the problem and ask some of the thinking aloud questions and let the students respond. Gradually, I'll lead them to do the think aloud part. After we've figured out what the problem is asking and pulled out the important information we'll choose a strategy and solve the problem. I may have them solve the problem with a partner or on their own. Then we share solutions, making sure to discuss that there is usually more than one way to solve a problem. We always end with a review and answer check, which I consider one of the most important steps in this process. You do it- After several days of doing the problems together, the students are ready to solve a word problem on their own. At first they'll need visual and verbal cues for the steps, but gradually, these steps should become automatic. I like to begin the "You do it" phase with partners and move on to individual work later. I think the easiest strategy to begin with is using manipulatives. This is a very concrete way for students to visualize what is going on in the problem. The manipulatives can be little blocks, teddy bear counters, clocks, coins or anything that can be moved around to "act out" the problem. After using manipulatives I usually teach the strategy draw a picture. I think this strategy is my favorite. I'm a visual learning and sketching out the information helps me make sense of the problem. The other strategies can be taught in any order. I do suggest that you spend several days or a week on each strategy before introducing a new one. Most problems can be solved in multiple ways. 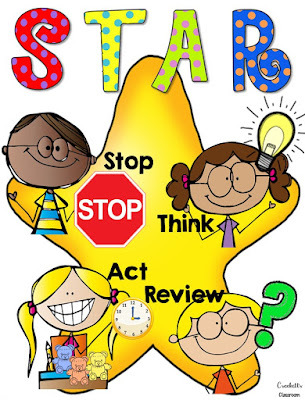 Some kids will even use parts of two or three different strategies to solve a problem. One thing I require is that they be able to explain their thinking. They need to be able to tell what they did and why. I only teach one strategy at a time. Depending on my group of students and their previous experience with these steps and strategies I'll spend about a week on each strategy. These strategies will help students solve almost any word problem they will ever come across. I don't teach key words. Not all word problems have key words and not all word problems require an addition, subtraction, multiplication or division equation. Some strategies work better with certain problems, but most word problems can be solved using several different strategies. After the students are familiar with 2 or 3 strategies I'll have several days where I'll give them a few problems and let them choose the strategy they want to solve the problem. I love it when students use different strategies and they all come up with the same answer! We always take time to share our strategies and thinking. I also ask them why they chose a certain strategy. Sharing their thinking aloud is very important because it lets the students who may be struggling have a "peek" inside their brains!